You can right click on any test or collection of tests and run them. You can run just the tests you select in code, run tests you select in reported results, rerun all tests or just previously failed tests, or run tests in a selected class, file, or package. The results pane mirrors the structure of the specification (i.e., if your BDD-style specification text is nested in the source, it will appear nested in the results pane). You can hop from results to test, scope, class, or line of failed code. You can unfold the top of that stack that is automatically folded so only the offending line of code is shown. And, because ScalaTest is a platform that can support different styles of testing, the plugin can be extended to grant full IDE support for non-ScalaTest-native styles, such as a ScalaCheck Properties classes, Specs2 Specifications, or custom styles. 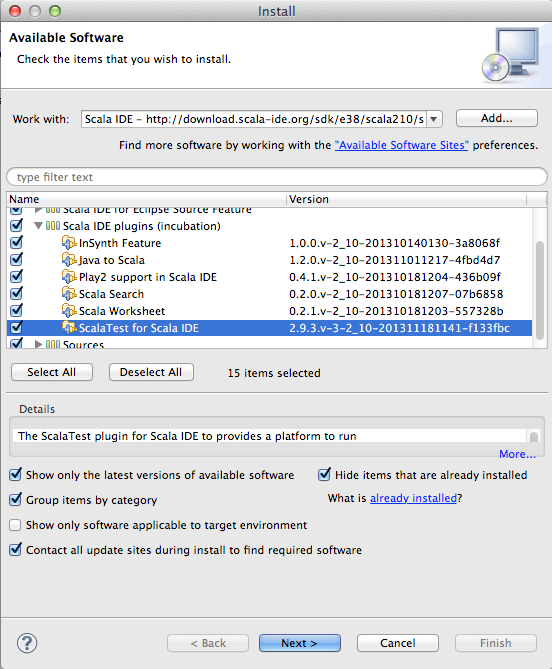 To use ScalaTest in your Scala project, you must download ScalaTest and include it in build path of your project. Test result view built in the eclipse workspace. Running of selected specific test or scope. 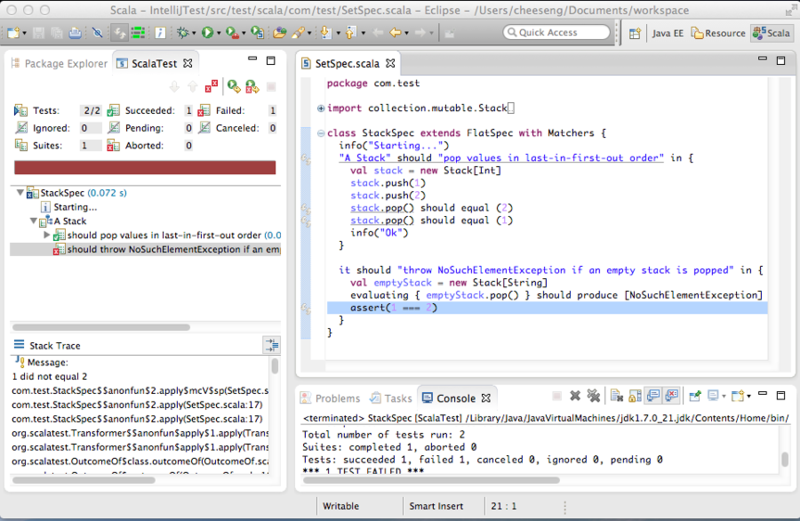 When using ScalaTest 1.x, the GUI Runner provided by ScalaTest will be used instead of the built-in test result view. By choosing the suite source in an opened Scala source file within the editor. By choosing the suite class from Project Explorer/Navigator/Outline view. A Run Configuration with the suite name will be created automatically. A Run Configuration with the test name will be created automatically. A Run Configuration with the scope name will be created automatically. By choosing an opened Scala source file containing ScalaTest suite(s) in the editor. By choosing the Scala source file containing ScalaTest suite(s) from Project Explorer/Navigator. All ScalaTest suites in the selected Scala source file will be run. A Run Configuration with the file name will be created automatically. All ScalaTest suites in the selected package (not nested package) will be run. To include ScalaTest suites in nested packages, you'll need to select the 'Include Nested' option in the Run Configuration. A Run Configuration with the package name will be created automatically. Suite - You specify Suite class name (mandatory) and test name(s) to run. If no test name is specified, all test(s) in the suite will be run. File - You specify Suite file (mandatory) to run, all ScalaTest suites in the selected file will be run. Package - You specify Package name (mandatory) and whether to include nested package, all ScalaTest suites in the selected package will be run. If 'Include Nested' is selected, all ScalaTest suites in nested package will be run as well.